How was it? Did you add one topping too many? It's the gummy bear effect and it waylays the best of us at sundae bars. Always stick with two toppings and, on special occasions, add a third. The fourth is where you'll discover that you don't want to eat what you have made. Speaking of not eating what you build, the following is the relevant 'K' terms in the Brick Encyclopedia. K is for...KFOL (Kid Fan of LEGO). This is either the child of an Adult Fan of LEGO (AFOL) or just your average kid that enjoys playing with the plastic bricks. K is for...K'Nex. To those who would consider this their favorite building toy, you have my sympathies. I look forward to viewing your marble and steel creations in the mall one day. K is for...Kjeld Kirk Kristiansen. The current owner and grandson of LEGO's founder -- Kjeld is a cult hero among AFOLs for helping to restructure the company and bring it back to profitability over the past five years. K is for...Kit. It's a word that is used interchangeably with set, but often refers to a custom model, designed and packaged by fans. The custom kits are then sold on the Internet or at fan conventions. The talking car (spelled KITT) on Knight Rider or Baloo's sidekick from Talespin are also acceptable definitions. K is for...Knight's Kingdom. 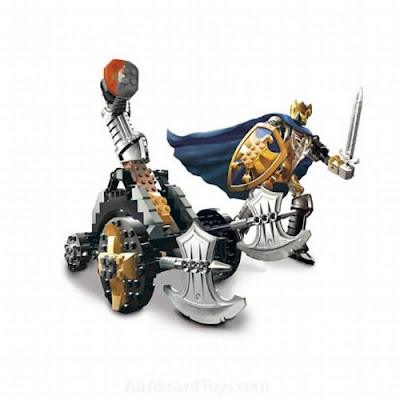 A LEGO playtheme with two iterations in this decade, the Knight's Kingdom figurines were essentially action figures. And yes, I've fought with them in mock battle before.